Yep, we’re looking forward to the weekend already. I don’t know about you, but for me, once Wednesday rolls around I’m already thinking about wrapping up my week and getting ready to enjoy the weekend. In fact, earlier this summer I took a tip from Lee at Fit Foodie Finds and tried to manage my time so that I could take most Fridays off, or at least only work half a day. Now that I’m trying to get tons of stuff prepped for when baby comes those Fridays off are few and far between, but it doesn’t stop me from spending the last couple days of the week thinking about what I’m going to do (and eat!) 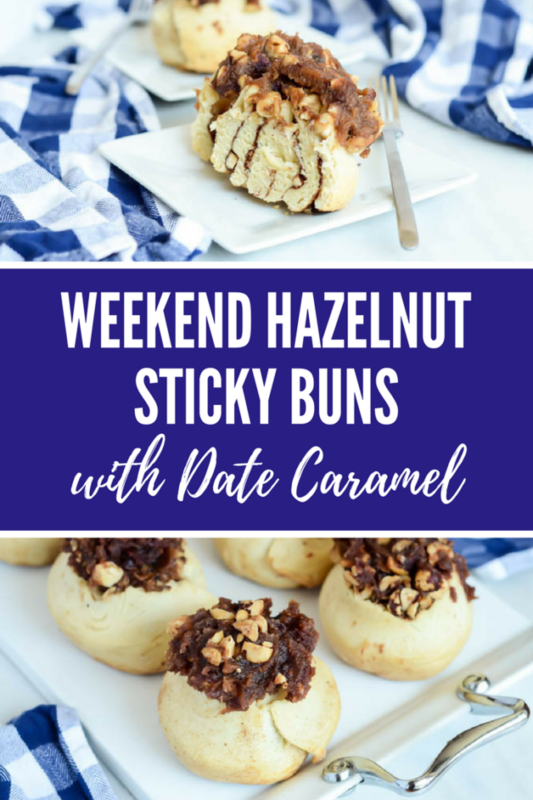 over the weekend – enter these Weekend Hazelnut Sticky Buns with Date Caramel! 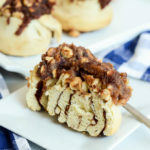 Creating a date caramel sticky bun and incorporating the yummy taste of toasted hazelnuts was another random idea that came to me with no formal inspiration whatsoever. This doesn’t happen very often (and, in fact, I wish it happened more) so when I do have these out-of-nowhere inspirations, I’m sure to act on them ASAP. You might remember that I’m a huge fan of cinnamon rolls (like these Chunky Monkey Cinnamon Rolls with Chocolate Glaze and these Pumpkin Praline Cinnamon Rolls with Bourbon Cream Cheese Frosting), but I had yet to foray into the world of sticky buns. I turned to one of my favorite bakers, Thomas Keller, and his Bouchon Bakery cookbook to get a rundown on what exactly I needed to do to make these happen. Now, we all know that Mr. Keller doesn’t cut any corners, so I took liberties to shorten the process up a bit where I thought it was needed and round the measurements out to those that a normal person would use without needing a kitchen scale. I of course also made my own date caramel rather than the cookbook’s version of the sticky filling and subbed in toasted hazelnuts in lieu of the traditional pecans. 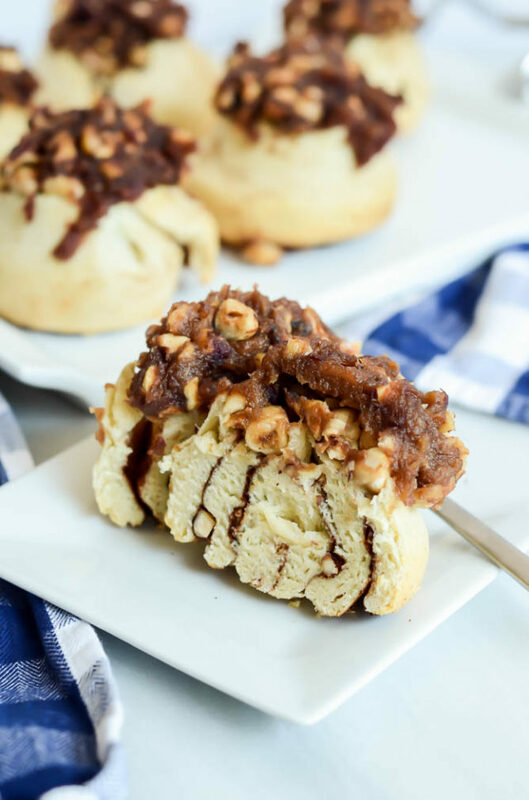 As much as I tried to simplify the process for making these Weekend Hazelnut Sticky Buns with Date Caramel, they are still a bit of a process. 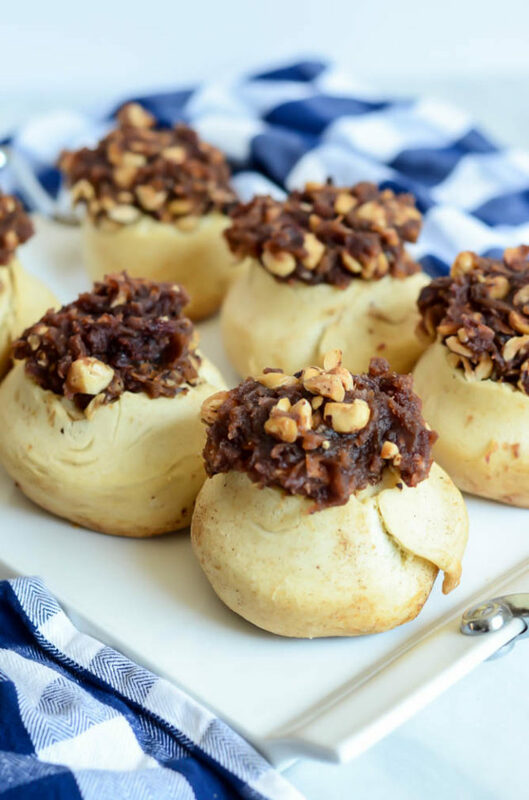 You’ll want to start the dough and make the date caramel a day before you plan on baking the buns, and if you want to devour them for breakfast then you’ll have a bit of an early wake-up call but trust me, it’s so worth it! And, I mean, if you want to sleep in a bit and not serve them until closer to lunch (brunch?) I’m sure you’ll have plenty of takers on your hands. 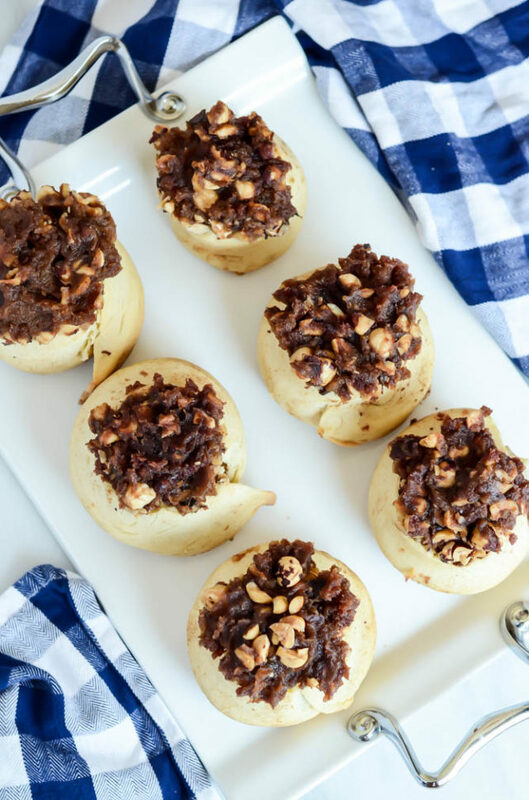 No matter when or how you decide to bake them, these Weekend Hazelnut Sticky Buns with Date Caramel are uber-delicious and bound to become a new family favorite. They’re best fresh out of the oven, of course, but I’d be lying if I said I didn’t have a whole batch of them waiting for me in the freezer for after Baby D is born. While these definitely deserve to be baked up this weekend, they’d also be the perfect breakfast treat for Thanksgiving weekend or Christmas morning. And the date caramel makes them healthy, right?? 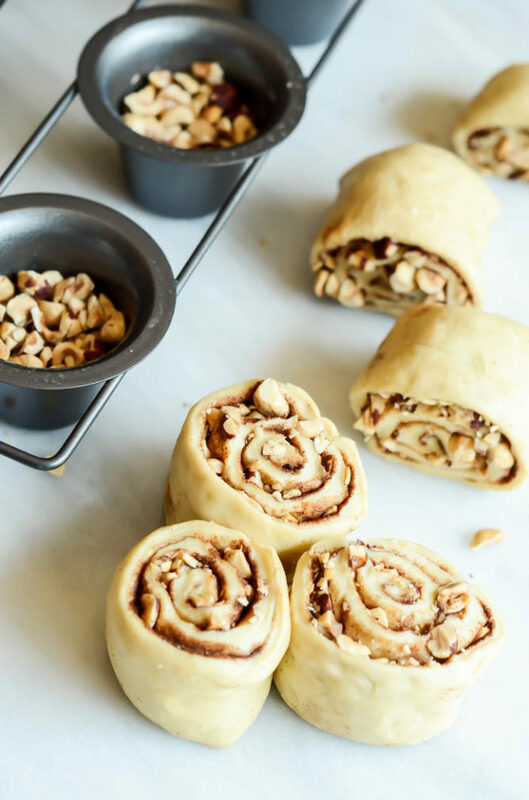 The classic bakery breakfast pastry gets a modern-day makeover with hazelnuts in lieu of pecans and a healthier date caramel filling. The day before you plan on baking your buns, prep the dough and date caramel. Soak the pitted dates in warm water for 10 minutes, then drain and transfer to a food processor with the rest of the date caramel ingredients. Process until caramel is smooth and transfer to a resealable container to store in the refrigerator overnight. Next, prep the dough. Add the flour and yeast to the bowl of a stand mixer fitted with the dough hook attachment. Mix on low for 15 seconds. Add eggs, milk and salt and mix on medium-low for 4 minutes, scraping down the sides as needed. Add the ½ cup plus 2 tablespoons butter, a little at a time, beating until incorporated after each addition. Stop the mixer, scrape down the sides and mix on low for another 5 minutes. Turn dough out onto a lightly floured surface and knead for a few minutes, adding a small sprinkle of flour if the dough gets too sticky to handle. Transfer dough to a bowl coated with cooking spray, cover with plastic wrap and let rise for one hour. After the first rise is complete, turn the dough out onto a lightly floured surface once again and knead gently for just a few minutes. Return dough to the bowl, cover once again and let rise in the refrigerator overnight. The next morning, remove the dough from the refrigerator, turn it out onto a lightly floured surface once again, and roll dough out into a 16-inch square. Also remove the date caramel from the refrigerator at this time to let it come to room temperature. Spread 2-4 tablespoons melted butter onto dough with a pastry brush. In a small bowl, mix together the cinnamon and sugar and then sprinkle this mixture over the melted butter on the dough. Let sit for a moment while you prep the oven and baking pan. Preheat the oven to 350 degrees Fahrenheit. Spray a jumbo muffin tin or popover pan generously with nonstick cooking spray. Place 2 tablespoons of the date caramel in each cup followed by 2 tablespoons of the toasted hazelnuts. Now, return to your dough and sprinkle the remaining hazelnuts over the cinnamon sugar mixture. Roll the dough up into a cylinder and trim off the ends, pinching it together at the seams. Cut the cylinder into 6 equal pieces and place each piece in one of the muffin tins, on top of the date caramel and hazelnuts. Press your finger into the middle of each one to spread it to the edges. Place sticky buns in the 350 degree oven and back for 20-25 minutes, or until slightly golden. Immediately invert onto a Silpat. If any of the caramel stays stuck in the pan, simply scoop it out with a spoon and on top of the now inverted buns. Let cool completely (or almost completely) before serving.